Disturbing Video Footage: Chaos In The Streets Of Venezuela - Stores Ransacked - National Guard Called Out - Is THIS What's Coming To America? Back on December 15th we reported the government of Venezuela had given their people a 72-hour notice on phasing out their largest bill denomination, the 100 bolivar, worth an entire 3 cents to every US dollar. However, as we learn today from Reuters, things didn't go quite as well as the govt had planned with the citizens of Venezuela taking to the streets and widespread social unrest and chaos causing the them to postpone the currency move until early January of 2017. And while some readers of ANP might ask why we continue to go back to this tragedy that is happening thousands of miles away from most of us, the answer is quite simple: there but for the Grace of God go we. 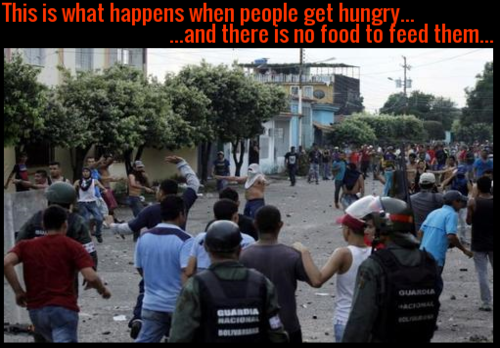 Once looked at as a shiny gem of socialism, their dreams of paradise have turned into a nightmare with food and cash shortages alongside widespread shortages of basic supplies, giving all of us a direct look at a nation in complete collapse without having to go through it by living there. 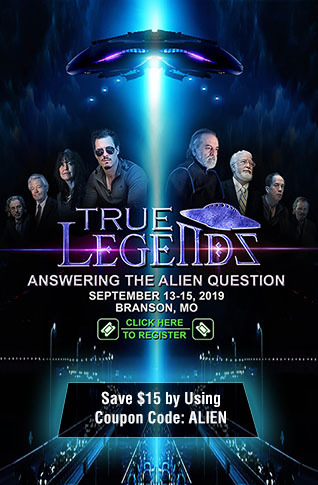 Parents selling their children so they won't starve to death, we see and hear in the videos below why its so important that we prepare for such a time here in America as well. As this new story from Jeremiah Johnson over at SHTFPlan lays out plainly, the people who have been orchestrating the colllapse have not halted their agenda just because Donald Trump was voted into office. 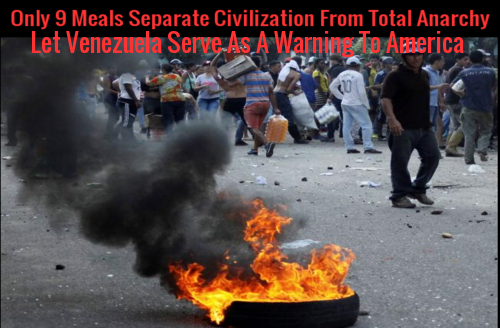 With Venezuelans breaking into stores and looting food to survive, we see why it's long been warned that only 9 meals separate civilization from total anarchy - a warning to America playing out before our very eyes for those who choose to see it. And in the first video below, we see 7+ minutes of 'live' video footage showing stores being ransacked and food and supplies stolen as Venezuelans quite literally take to the streets in total chaos. As we hear in the final video below from Realist News, Venezuela has been forced to call out the national guard to deal with the protests and chaos going on in the streets where at least one person has already died with anarchy spreading across the nation. While the mainstream media might say food being used as a weapon is 'fake news', we've seen it being used as a weapon by socialist dictators throughout history so why should 2016 or 2017 be an exception? As we see throughout this story in these photographs and video footage of some of the protests and anarchy, this is what happens when everything falls apart. While America looks much different now than the America that went through the Great Depression, imagine what US city streets might look like should we go through the same thing that Venezuela is going through right now. The anti-Trump protests would likely look like a 'cake walk through the park' in comparison to millions of hungry Americans taking to the streets. As we read below from Reuters, things aren't getting any better in Venezuela. 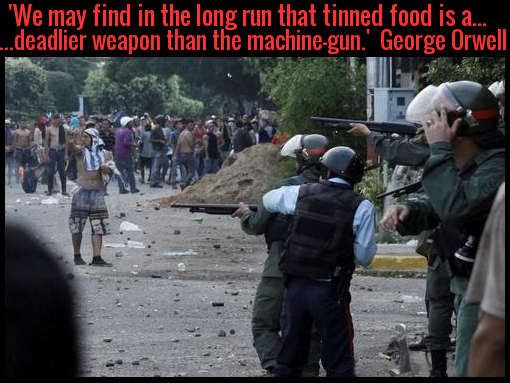 Might we soon see the same kinds of things happening in America that we're witnessing happening in Venezuela now? Venezuelan President Nicolas Maduro suspended on Saturday the elimination of the country's largest denomination bill, which had sparked cash shortages and nationwide unrest, saying the measure would be postponed until early January. Adding to the chaos, Venezuela has the world's highest rate of inflation, meaning large bags of cash must be humped around to pay for basic items. It's long been warned that when the food was all gone, people wouldn't be able to eat their worthless money, thus our constant insistence and urging that people stock up now for that 'rainy day' that we pray never comes. 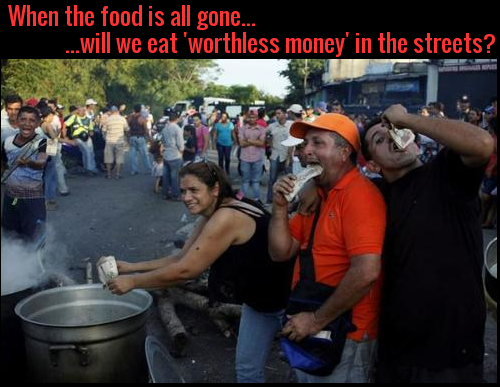 As we see in the photographs and videos within this story, that 'rainy day' has already come to Venezuela and those who didn't prepare for it are quite literally now out on the streets, protesting via eating their worthless money. As this new story from Zero Hedge reports, according to Venezuelan president Nicolas Maduro, Venezuela is now a victim of 'international economic sabotage' by Barack Obama and the US Treasury. With the nations recent attempt to ban the largest bill they have on such short notice, all-out havoc was created for millions of Venezuelans. Despite claims about fighting criminals, foreign influence, and corruption, ordinary Venezuelans are those most affected by the government’s fiscal whims. Already suffering from inflation that is wiping out the nation’s savings and purchasing power – the IMF calculates that inflation will rise to 470% by the end of the year, and 1,660% in 2017 – ordinary citizens are now forced to scramble to meet the government’s absurdly tight deadline. Moreover, many poor Venezuelans do not have bank accounts, preventing them from depositing their money. With Venezuela sending a loud and clear warning to America for those who are paying attention, the 2nd video below gives us another look at the chaos in the streets of Venezuela, enough chaos to make anybody paying attention prepare as residents there break into stores, stealing everything they possibly can in desperate attempts to survive. And with Europe falling into chaos with warnings of possible civil war breaking out across several nations as unchecked immigration leads to terrorism and outright lawlessness in many European streets, America looks ahead at 2017 wondering what it might bring with Donald Trump voted into office in an attempt to reverse the decades-long decay here. And while we're happy that Trump will be getting into office rather than his opponent on January 20th of 2017, we all know that if a major widespread emergency strikes, even Trump's government won't likely save us. So what we see in these videos should be a warning to us all with a present-day look at a nation in collapse that we pay doesn't come to America. But knowing that the globalists overall, long-standing goal is to bring us crashing down should tell us all we need to know.